Discover the best remote access software for your PC! Monflo provides fast and smooth remote PC access! Play your favorite PC games and control your Windows desktop with Android devices or another Windows PC! Try now! The unbeatable Monflo’s performance guarantees the smoothest - and as lag-free as it can possibly be - real-time HD PC remote control ever! Try Monflo for free and see by yourself - watch videos, access and control Windows desktop and every application in superb HD quality. 2. Use all Windows applications remotely on Android devices! Imagine that you can use any desktop application on your Android device. With Monflo remote access software you will get instant access to your projects, documents, presentations and every application you have installed on your PC in outstanding quality and speed, wherever you are! Access your Windows PC wherever you are at any time. There is no restrictions in using Monflo to remote from your Android device or another computer. Even double NAT will not be a problem! Do not let yourself be stopped by any technical issues! With Monflo you get the easiest remote access to your PC on the market! Just choose the computer you want to remote to from the list on your client device and it’s done! With Monflo’s easy and intuitive user interface you won’t get lost at any point of using remote control software. Monflo provides the best performance, quality and user experience of PC remote access software. Access your PC applications in smooth HD quality, both on your Android devices and Windows desktops! 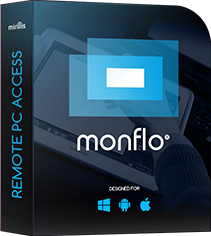 Remote PC access with Monflo is easy! Our application provides sleek and user-friendly interface, ultra-fast and easy setup. Preset your own Favourite Lists and access your most often used applications faster and with ease. Our Invitations system allows you to create invitations for your friends or work partners to let them access your PC remotely. The access can be time restricted and controlled at all time, you can delete and cancel active invitations wherever you are. Transfer any files between your server and client devices wherever you are. Stay connected and have access to everything what you need from your PC. Keep your documents, pictures or presentations close to you at any time. With Monflo on your Android device or PC you can remotely browse and watch all your PC movies, videos, TV and LIVE streamed events in smooth HD quality. Monflo provides the best remote PC video playback experience! Monflo remote control software gives you around-the-clock access to any webcam connected to your PC. Stay updated wherever you are by accessing the live view of any of your cameras through Monflo. Our remote control software won’t let you to miss anything. "Favourite List" creator feature is an option that you will fall in love with. Categorize and list any applications and games that you use often and have a quick access to them. You don't have to search for the applications you want to use all over your Windows computer. Save the time with our list creator and get easy access to all the applications that you need at the time. Thanks to our cutting-edge technology the ultra-high performance in HD quality is accompanied by very low CPU and GPU usage. It uses Mirillis ultra-fast, multicore optimized application engine, which provides the ultimate performance of HD quality. All data transmitted with Monflo, including audio/video and mouse/keyboard data, is encrypted. To avoid unauthorized connections you can require additional device authorization for every new device trying to access your PC. We keep your data and privacy secured. Thanks to the High Efficiency Video Coding (HEVC), also known as H.265, Monflo offers almost double data compression ratio, sustaining the same level of video quality, or considerable improvement of the quality of recorded videos at the same bit rate. * HEVC will be soon available with free updates.